Manufactured by Campbell Hausfeld, the Husky air compressor offers the power to utilize numerous tools. So whether it is a spray gun, a grinder, air powered sanders or numerous such tools, the Husky air compressor can power it all. When you need to buy one it makes sense to know a little bit more about them to make sure that you make the correct decision and buy the right product. The time and effort will be worth the money you will spend for the purchase. You can get the Husky air compressor in a vertical and a horizontal model. Using a vertical model, which is larger, takes up less space for storage. It is also easy to make them stay at one place and they do not have wheels or handles to push them around. However if you are planning to buy the horizontal model then they have the advantage of portability. If you need the compressors for larger tools that are used frequently, it makes sense to buy one with a higher capacity compressor. On the other hand, smaller, home use tools which are not utilized frequently can make do with a smaller one. 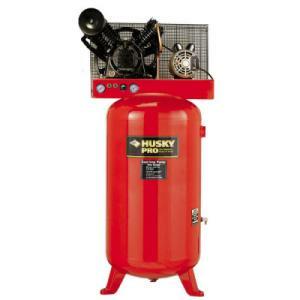 You need to pay attention to air pressure before you plan to buy a Husky air compressor. Many tools that you would be planning to buy require different air pressures and so it would be pertinent to buy an air compressor that can power the different amount of air pressures needed for your tools. Be sure to find out the exact specifications that you need for your tool. You would not want to end up paying a hefty amount for an air compressor that would not be required frequently. With an air compressor, there will always be a usage for it in a household or even for professional usage. Make sure it is an investment that meets your expectations so that you get the best usage out of it over the years. Return From Husky Air Compressor Page to Home - Finishcarpentryhelp.com.